Avoiding tube euphonics yet capturing tube magic. Hong-Kong based YS-Audio was founded in 1988 by designer Chui Yat Sang and has been focused on quality valve products since then. Their gear now bears the logo "Audio Experience" and is available for sale online and certainly on eBay. Note that my review sample was delivered by The Pacific Valve and Electric Company (PV), which in their own words "was created to fill the need of high end audio, particularly tube equipment, at a reasonable price point." Audio gear is imported primarily from China. I was told that PV's relationship with all their vendors is that of an importer/retailer, rather than importer/distributor, since product is not offered for re-sale in other outlets. PV also does not demand exclusivity, the benefit being that they can "cherry pick" products to offer on their website - as opposed to carrying the entire manufacturer's line. Following this business model allows PV "to reach out to many manufacturers globally, who prefer this model, and carry equipment that we think is: 1) unique in design, 2) offers the best value 3) gives us a competitive advantage from a price/performance level." This, I'm told, is the "Long Tail" approach to marketing and retailing – the niche strategy of selling a large number of unique items in relatively small quantities. It does strike me as a splendid model for satisfying audiophiles' needs. It is also important to point out that the selection process involves a listening panel of staff and friends, and once an item passes, it is evaluated by the PV techs for construction quality and tolerances. Repairs are performed in-house. Each product sold is branded with a PV serial number to ensure warranty repair service. However, PV does not repair similar product purchased by consumers directly from overseas or on eBay. There was a time some thirty years ago when a preamplifier was purchased primarily on the basis of its phono stage quality. The line section was merely an adjunct for providing additional gain for the phono input and for servicing secondary line-level sources such as tuners and tape decks. Today the line stage or line preamp has become objectified as a darling of high-end audio. Prices in excess of $10,000 at the retail level are commonplace. The funny thing is that if you're strictly into CD/SACD playback then in most applications you actually don't even need any gain. Many line stages insert 20 dB of gain into the chain, which for a nominal CD input level, has to be attenuated by the volume control. That's plain silly. A buffer stage with a volume control would fit the needs of most digital front ends very nicely indeed. And I'm specifically thinking here of Nelson Pass's First Watt B1 buffer stage. I have made the suggestion some time ago that a line preamplifier should dedicate at least one input as buffer stage, giving the user more flexibility in configuring his or her system. As far as I can tell, no manufacturers have taken up such an approach. So if gobs of gain is not a priority for a line preamp, then there is little reason to engineer the circuit with more than a single gain stage. That's exactly the approach taken by YS Audio: keep the circuit as simple as it needs to be. A single SRPP gain stage is followed by a buffer stage. Unusually for this price point, the circuitry offers balanced amplification. Two 12AT7 dual triodes are used per channel for amplification of both the hot and cold signals (pins 2 and 3 on the XLR connector). A single 5687 computer-grade tube is used per channel as a buffer stage. A clever resistive phase inverter network is used to balance the single-ended input. In case you're wondering why the unit is not phase inverting with only a single voltage gain stage, polarity is reversed internally at the outputs to maintain normal phase. The signal passes through two potentiometers before reaching the grids of the first stage. The first pot allows for setting channel balance and for overall gain trim. The second pot acts as a stereo volume control. The volume control is a motorized Alps pot with a remote that also controls input source selection. There are four sets of balanced and unbalanced inputs, two sets of balanced and un balanced outputs, a record out, and a home theater bypass loop. A 60- second soft-start circuit ramps up plate voltages in a controlled manner. One minor grip. The Power On LED is so bright as to be a distraction in a dimly lit room. My solution was to tape it over. The power supply uses a compact R-core power transformer, is solid-state rectified, and plate voltages are regulated. Note that the unit under review is the Special Edition (SE) version of the A2. This SE version is upgraded with premium Cardas CTFA RCA jacks, Neutrik XLR connectors, and Sonicap coupling capacitors. All in all, a worthwhile upgrade, considering that connectors can have a significant sonic impact on overall sound quality. What do you do when you have a balanced power amplifier (Electrocompaniet AW180) in house for review and none of your preamps offer balanced operation? Well, the first option is to use an XLR to RCA adapter. I did that, and by the way, I can safely recommend the Cardas adapter as far superior sonically to any of the mass market versions. I've been a single-ended guy for too long to accept balanced operation as necessarily superior for home audio applications, but in terms of the evaluation it was essential to mate the AW180 with a balanced preamp. Option two, therefore, was to go shopping for a balanced preamp, and that's how the A2-SE materialized in the reference system and was put to good use. Integrating a preamp successfully into any system is very much dependent on compatibility with the associated system components. With the DALI Helicon 400 Mk.II loudspeakers, the A2-SE made a fabulous first impression, especially when operated in balanced mode. And in hindsight, it is clear that there was undeniable synergy in the air. Its sonic strengths were readily apparent: transparent soundstage, tight, palpable image outlines, and rhythmic delivery highly resolving of timing nuances. 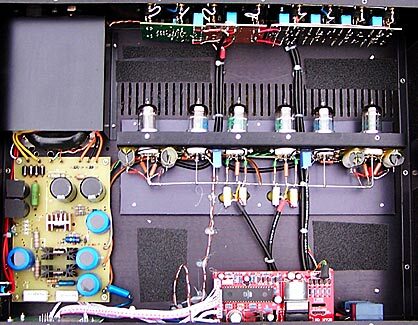 Speed of attack combined and clarity of transient decay were exceptional for a tube preamp. The midrange was slightly sweet, imbued with a touch of natural warmth solid-state amplification desperately needs a dose of. Brushed cymbals sounded just right with plenty of high-frequency air. Bass lines were not only tight, but it was apparent that the A2-SE could elicit terrific bass punch from the AW180. The A2-SE spent a fair amount of time going heads up against the more expensive Mystère CA21 Line Preamplifier ($2195). The latter features a tube-rectified power supply and 6SN7 based gain and buffer stages. It's single-ended, but conceptually similar to the layout of the A2-SE. I have for some time now substituted NOS 7N7 and 7AF7 Loktals for new production Russian and Chinese 6SN7 which frankly stinks. So outfitted, the Mystère is capable of generating a big tone lower midrange which no 9-pin miniature seems able to match. The A2 certainly did not fatten up the AW180's lower mids and in general lacked the Mystère's rich harmonic textural density. Aside from the choice of triodes, I suspect that some of the sonic difference is due to solid-state versus tube rectification. A least in my experience, tube rectified preamps have been able to portray harmonic textures with a density approaching that of the real thing. Harmonic colors also appear more saturated through an all-tube unit. I would be most interested to audition a tube rectified version of the A2-SE. The situation was more complex with the MartinLogan Summit X hybrid electrostatics. The Summit has few peers when it comes to low-level detail retrieval, transient speed, and purity of tone. Yet, it can overload a room with an over abundance of treble energy. I began to complain of a hyper-detailed, bright and texturally thin presentation and I presumed that the stock JAN Philips 12AT7 tube complement was partly to blame. Thus I embarked on a couple of tube rolling experiments designed to obtain richer textures and a slightly darker presentation. The winner turned out to be a NOS quad of GE 12AT7WA vintage 1954, black plates with triple mica spacers. Darker, yes, richer, yes, but at the end of the day, I had to accept the fact that the A2-SE was simply not the best match for the Summit, being too lively and forward through the treble range. Believe me, this is the wrong sonic personality for the Summit. With my Basszilla Platinum Edition Mk.2 DIY speaker, the A2-SE exceeded the Mystère CA-21's performance in terms of detail resolution and timbre accuracy. Yet, it lacked the CA21's big tone, and even when outfitted with upgraded 12AT7s it projected a brighter and more forward balance. It should be clear by now that the Audio Experience A2-SE requires careful system matching for optimum performance. It can lock-in on a Goldilocks -- just right tonal balance -- or at the other extreme project too lively a balance that is bound to interfere with long-term listening enjoyment. Its sound can best be summarized as fast, transparent and adept at reproducing timing nuances. It avoids typical tube euphonics, yet captures sufficient tube magic when it comes to image palpability and textural sweetness. The flexibility to accommodate both single-ended and balanced systems is quite a bonus. The A2-SE is in my estimation quite a remarkable performer at its price point and deserving of a serious audition.